Trust No One is the seventh release from DevilDriver. The album is certainly the same sound that they have been playing for years now, although it feels more revitalised and energetic. There is a distinct sense of power and command to the songs and the songwriting itself is great. All of the lyrics flowing really nicely and the sharp consistent riffs piercing there way into your head. They really come out swinging here with the tight production and stimulating melodies. I can’t really say it’s their best work, but there is definitely a drive behind this album, whereas the last couple felt a little tired. Right off the bat DevilDriver hits you with a cavalcade of powerful and commanding groove based riffs, in that familiar way. It’s all really nicely paced and creates an interesting sound in your head. Opening on “Testimony of Truth” and “Bad Deeds” the album really starts you off with a blast to your senses. The lead guitar sounds distorted beyond belief with twisted and winding sounds mixed with the amazing bass work, which is really well laid. All of it just pushes the songs forward with fantastic momentum and makes you want to keep listening. Seriously the album flies by, forty minutes feels like ten and when you have fist pumping songs like “Above It All”, “Daybreak” and “Trust No One” it’s really no surprise. I found myself wanting the next song to come on and it turns out that the album was over. Forcing me to restart the whole thing again. I’m a massive sucker for well done riffs and yeah, they’re simply spectacular here. They’re completely solid and uncompromising. They hit hard and let you just waver in the aftermath of their presence. When you add Dez Fafara’s insane vocal style on top of all of it it makes for one hell of a listening experience. Just simple heavy metal done really well no need for for any fancy gimmicks or weird stylistic choices. Pure heavy metal full on until the end. Overall, I’ve really enjoyed this album, although they haven’t much to change their style or innovate the genre. They have created something really pure and simple. Why change up a formula that already makes sense? After an arduous 48hrs of uncertainty, and with deepest reluctance we have been forced to cancel Temples Festival 2016. At the beginning of last week, the organisation we had onboard to finance the event pulled their funding, and with limited access to advance ticket sales and no sponsors to back us we have been unable to source the funding required to cover the overheads which would allow Temples Festival to go ahead. Following Temples 2015, we were left with a sizeable debt and as opposed to dissolving the company and declaring bankruptcy – I decided to take on the debts personally and subsequently pay off all our creditors in instalments as quickly as possible, this meant bands, staff and contractors were all paid late – and it’s had a crippling effect on both my professional and personal life as a whole – truth be told, I made a series of bad business decisions and dealt with the situation very poorly – which I take full accountability for. I’ve spent the past week trying to gain access to the funds we need to make this year work and avoid the problems we encountered following last year’s event, with our financiers pulling their involvement – it’s been an uphill battle, which I’ve fought to the best of my abilities – and unfortunately, have been defeated. Over the past weekend, I’ve been attempting to produce the festival’s continuation on a ‘scaled down’ level so we can offer something for those of you who have purchased tickets, accommodation, transport etc and allow the bands who are touring, UK based etc – unfortunately this morning it became clear that even if we were to proceed as such, we’d be left with another huge debt and therefore unable to pay the bands, staff, venue, contractors and a number of other crucial overheads the festival relies on – thus repeating the mistakes that were made last year. Having already lost in the region of £70,000 throughout Temples Festival’s existence – I’m afraid adding more debt to that will simply cripple both myself and the festival, and after such a difficult year it’s not an option for me to take on such a huge debt personally. I am deeply deeply sorry to all of those who will lose out as a result of this decision, having put three years of my life and having already lost so much of it to the festival I’m afraid there is no option to continue with Temples Festival 2016 and I take full responsibility for events cancellation. I am truly sorry. My intention was always to setup a unique UK festival which books bands who are rarely seen in the UK, I’ve tirelessly dedicated myself to this event for a long time now and the decision to cancel this year’s event has been unequivocally the hardest call I’ve ever had to make in my life. My sincere apologies to those of you who will lose out as a result of this, I am truly sorry – but I can’t face another year of debts & damage. Thank you to everyone who has actively supported Temples Festival from the start, I launched this ambitious event with the best intentions and unfortunately it’s become too damaging for me to oversee single handedly. Although curating the festival is something I’ve been able to do well – managing the business side of the event has proven too much for me. I’ve been promoting concerts for half of my life, and those of you who know of the work I’ve done will hopefully be aware of how upsetting and damaging this decision has been to me on every level. Our ethos has been No Surrender for the past year, as I was determined to make this festival work and finish what I started. I’ve worked so hard to make this happen for our Patrons in 2016 but against my will and core beliefs – today’s news has forced me to surrender. Ticket refunds are available from your point of purchase, please contact them for a full refund. Again, thank you to those of you who have been supporting this event for the past three years – your encouragement and kind words have kept me going through incredibly difficult times and I hope that despite this negative outcome you’ve at least enjoyed the two events we hosted for you. I’m proud of what was achieved with this event, and if there was any way of making this year work I’d be continuing with the same passion and dedication which oversaw the last two editions of Temples Festival. Following this cancellation, a number of bands have been left without dates for the first weekend of June. Rumours are doing the rounds at the moment, implying that one of the reasons for the cancellation is that acts that played last year’s Temples were never paid and the cancellation will have a knock-on effect towards the rest of the UK scene as well. It’s been a while since I’ve been to Helsinki. The last time I was there was late November last year when I walked through some heavy snowfall to see Cradle of Filth live. Since then, I either didn’t have the money or the time to travel even if there was some interesting concerts happening in the city. Then a few weeks ago I discovered that Hanzel Und Gretyl were coming to play two shows in Finland. I’ve been a fan of their music for some time now so I decided that it was worth going to Helsinki to see them live. The gig was at a rock bar/ nightclub called On The Rocks. Like many of gig venues in the city, this one had a good atmosphere but it was fairly expensive. After the show I got to meet the singer Vas Kallas and I had my photo taken with her. Overall it was a really good show and I had a great time. Even my husband, who isn’t too familiar with Hanzel Und Gretyl’s music, admitted that they were entertaining to watch. Neige et Noirceur (French for ‘Snow and Blackness’) is a French Canadian raw black metal project which was formed by the singer and multi-instrumentalist Zifond in 2005. It’s part of the growing Quebequois black metal scene or “le métal noir québécois” as it is known as within the francophone metal community. His latest effort ‘Les Ténèbres Modernes’ is a concept album about World War I and it features Schimaera (Industrie Chimère Noire, Portal, Profound Lore) on guest vocals. The opener Si Vis Pacem, Para Bellum sets the scene with its haunting guitars and grim vocals. It’s an interesting mixture of raw black metal similar to Burzum with some ambient and atmospheric elements such as keyboards and operatic-style choir samples at the start. Yet this is actually one of the slower and more melodic tracks on here. What follows is a barrage of nihilistic, harsh and eerie raw black metal that’s as bleak as its subject matter. Even the dark ambient parts such as the keyboard intro to La Saison des Morts or the end of Ciel d’Acier have that ghastly tinge, making the listener feel like one of the survivours of a battle, walking through a desolate field littered with blood and dead bodies. Then there’s Felgrau – an instrumental which is mostly dark ambient with the only “metal” element being the faint sound of a distorted guitar in the background. Perhaps this marks the point when the battle has ended and the rain has started to wash away the blood from the trenches…The avantgarde-style, ambient final track Adieux acts as a good summary of the overall theme with the sounds of gunfire, bomb blasts, radio broadcast, alarm sirens and absolutely no black metal elements at all. Overall, to say that I’ve enjoyed this album would an inaccurate assumption. One does not enjoy raw black metal but rather it is something to get engrossed into and admire. It’s just as grim and nihilistic as I expected it to be. Even when sang in French, a supposedly more melodic language, it sounds harsh and bleak. Owing to politics we neither understand nor participate in, we have been pulled from the Bloodstock 2016 line up. Understandably some Akercocke fans have voiced their displeasure at this news, with some of them referring to the festival as being petty and a joke. While the exact reason is unknown to Akercocke being pulled from the billing, it appears that it has something to do with the organisers of Bloodstock trying to keep an illusion of exclusivity as the band have been confirmed to play Damnation in November and will be touring the UK later this year. At the moment, Bloodstock have not made a statement to as why Akercocke are no longer on the bill. As much as we would like to answer your questions with our reasons for being forced to cancel the bands appearance, out of respect for the band, we wont air our laundry in public, but rest assured Bloodstock was left without any option on this occasion. Volbeat are one of those bands that just have it. I couldn’t tell you for the life of me what ‘it’ is, but they definitely have it. Over the years they have put out splendid record after bombastic hit. Once again I think they’ve done it again, well they have for me at least. Seal The Deal & Let’s Boogie, is their 6th studio album and it’s more of what have done over the years, it has a big sound, a lot of emotional power and the songs are catchy and anthemic. It is also the first album not to feature bassist, Anders Kjølholm who left in November 2015. This album has a lot to enjoy about it. From the big sounding production to the consistent and commanding song structure. All designed to be lodged in your head and to sing at the top of your lungs at live shows. Michael Poulsen’s vocals are crystal clear and have a lot of emotional weight to throw around and it’s matched by his own superb guitar work with Rob Caggiano’s blinding guitar skill as well. Everything on this album sounds big and expansive, it makes me want to track down all of the lyrics and sing them loud as I’m sure you will too. The pure emotion on the album is wonderful as every song has weight and they’re not just throw away rock songs to get as many people in a concert venue. The songs are quite frankly beautiful. Especially songs like For Eveigt (featuring Johan Olsen from Magtens), Mary Jane Kelly & Goodbye Forever. For Eveigt has this sweetness to it and the addition of Johan’s vocals only serves to add to the power of the song. Whilst Mary Jane Kelly & Goodby Forever have the aura of real honesty and the anthemic choruses are genuinely fun to sing along to. By the way the gospel choir on Goodbye Forever nearly brought me to tears, it’s not a sad song, but it just was done so well that it got me emotional. Then you get to the other thing that Volbeat do exceptional well. Kicking you in the arse with hard rock awesomeness (side note: is it strange my spellchecker recognised that word?). Oh well, songs like the album’s lead in single The Devil’s Bleeding Crown and Seal The Deal are sure to keep old school rock fans satisfied. With Caggiano’s signature guitar stings and sweeping solos mixed with the incredible riffs that keep you pumped for hours. 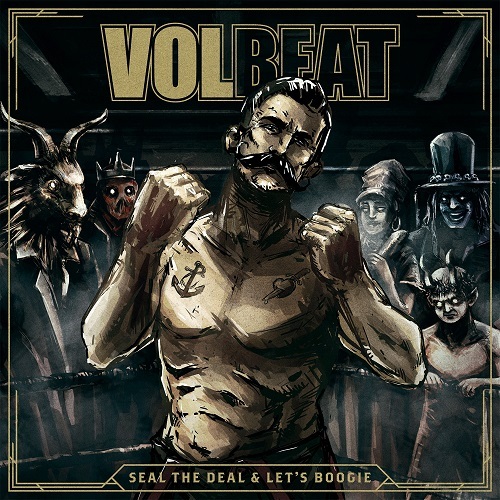 Volbeat really have made something amazing here. Mixing all rock styles, from hard rock to metal to blues to ballads. There’s seemingly no style that they can’t take and make their own. This is a definite must for anyone in 2016.